We've put together a very special package to take the controls of Deltic 55019 "Royal Highland Fusilier" during its visit to the railway in the Autumn of 2018! 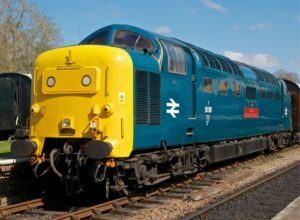 Drive, under professional instruction, one of the legendary Deltic locos on our double-track main line. The original fleet of 22 locos dominated express passenger services on the East Coast Main Line from the early 1960s until the arrival of the High Speed Train in the late 1970s. The package offers 16 miles of driving (a full round trip of our railway) with coaches. Souvenir mug and pen from the Deltic Preservation Society. Places are available on selected weekdays in October 2018. To book this unique experience, please telephone our Booking Office on 01509 632323. All bookings are made in accordance with the Company’s Conditions of Carriage and the special condition that the Company reserves the right to cancel, amend or alter any service offered and that no refunds will be provided where an alternative or amended service has been offered. Participants must be over 18 years of age and be physically and mentally fit with reasonable hearing and vision. In particular participants must be capable of climbing up and descending the vertical steps between the footplate of the locomotive and ground level (approximately 6’). The Company reserves the right to refuse access onto locomotives to anyone who appears to be unfit to operate them. This includes anyone who appears to be under the influence of drugs or alcohol. Please note that cameras (still or video), or mobile phones, should not be used on the locomotive when it is in motion. Applicants need not have any previous locomotive driving experience. All bookings should be accompanied by full payment or credit / debit card details. If you are unsure whether the person for whom the booking is intended can meet all of these conditions please call our booking office for advice before purchasing an experience. Please make all cheques payable to Great Central Railway PLC. A full refund will only be offered up to 14 days from the date of purchase subject to a £20.00 administration fee. Thereafter refunds will only be considered in exceptional and unforeseen cases where, for instance, the recipient has suffered serious injury or illness and in the opinion of the Company would be unable to undertake the experience. Failure to turn up on the day without prior notification will result in the experience being considered redeemed. Two steam locomotives are in action for our Easter Animal Fun event.